Obituary for Gloria A. (Romano) Riggi | DeMarco-Stone Funeral Home Inc.
Gloria A. Riggi, 86, of Schenectady, passed away peacefully at home, surrounded by her family on Thursday, June, 21, 2018. 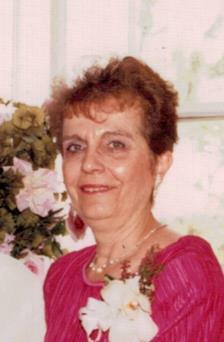 Gloria was a lifelong Schenectady resident and graduated from Mont Pleasant High School in Schenectady. She was employed for several years as a secretary with the General Electric Co. and later worked for many years as a secretary with St. Johnsbury Trucking in Latham. She was a longtime member of Our Lady of Mt. Carmel Church. Gloria was predeceased by her parents, Luigi and Dominica Longo Romano, her brother, Vito Romano and sister, Fran Speck. She is survived by her husband of 58 yrs, Anthony Riggi, her son; Anthony Riggi of Schenectady ,two daughters; Christine (John) Gentile of Duanesburg and Mary (Robert) Gradoni of Rotterdam, her sister; Laura Disco of Rotterdam and seven grandchildren; Daniel Gentile, Michael Gentile, Gabriel (Tara) Gentile, Matthew Gentile, Victoria Gentile, James Gradoni and Caleb Gradoni. Calling hours will be held on Sunday from 3 pm to 6 pm at the DeMarco-Stone Funeral Home, 1605 Helderberg Ave.
Funeral services will begin on Monday, 8:15 am from the funeral home, followed at 9 am by a Mass of Christian Burial at Our Lady of Mt. Carmel Church. Burial will be in St. Joseph’s Cemetery. In lieu of flowers, please consider making memorial donations to Community Hospice, 310 South Manning Blvd. Albany, 12208.